Read our local newspaper in PDF format (click the image to view). Browse & search archives at the Courier Home Page. Waipa's new weekly newspaper (click the image to view). Archives are available at the Waipa Post Home Page. 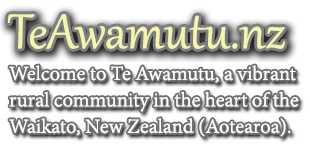 Join our forums to discuss local news and issues, ask questions, meet Te Awamutu people and shoot the breeze. for our town and district. Games, puzzles and other family-friendly activities. Activities, Showcase, Education and more.